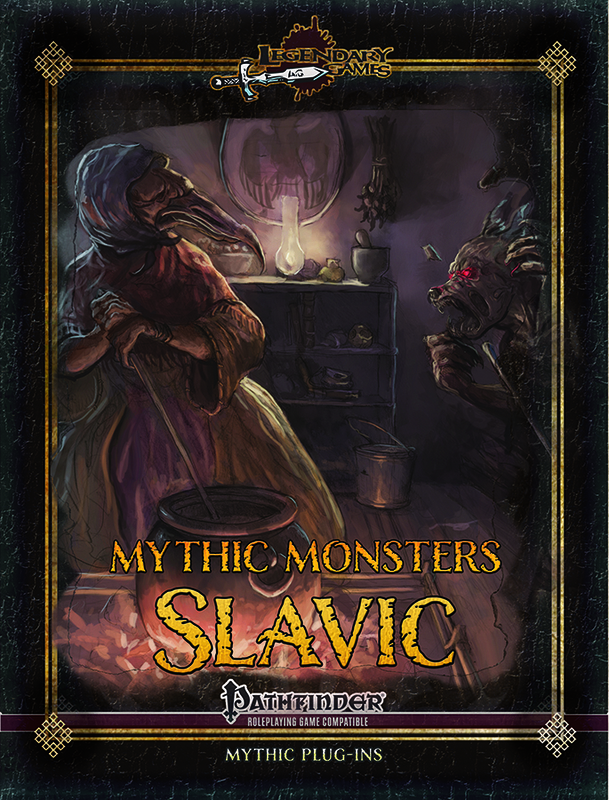 Mythic Monsters: Slavic brings you an amazing and exciting assortment of monsters from the fens, fields, forests, and rivers of Eastern Europe, from the Balkan south to the Russian north and all points in between. Drawn from a variety of cultures and traditions, even a few from the neighboring Baltic lore of Finland and Germany, these creatures range from CR 1 to 21 and range from mild and almost benevolent spirits of home and hearth to dreadful doombringers of titanic size and terrifying evil. The kindly kikimora might tend house and home from her humble hidey-hole, but her irascible temper can make her unpredictable at best, much like the wise but wily vodyanoi, just as likely to bargain and banter as to drown and devour anyone that displeases them, or even trap their soul for all eternity. A triumvirate of humble house spirits guard and tend the home fires, including the hot-tempered ovinnik, the industrious domovoi, and the garden guardian dvorovoi. The Slavic spirits of nature are beautiful and terrible in turn, from the graceful air veela and their delightful dance of death to metamorphic and misty etiainen and the seductive rusalka trapped just beneath the water’s surface, all too eager to add another conquest to their boudoir of bodies. These beasts of the east can be vicious like the hungry vukodlak or the cunningbagiennik, with savage serpents from the venomous tiny tatzlwyrm to the titanic three-headed gorynych. As if a dozen existing monsters were not enough, the brand-new stalimedved is an ironclad dreadnought, a mighty mystic bear perverted through foul mystic power into a steel-shod engine of destruction. In addition to the featured creatures, we bring you a delightful short story in traditional form, the fable of The Bear with Steel Fur! Grab this 30-page mythic monster supplement today and Make Your Game Legendary! This all-new 30-page supplement by Victoria Jaczko is a terrific complement to the Mythic Monster Manual, with over 220 mythic monsters and an awesome array of monster-focused abilities, feats, and more for your Pathfinder game! Pick up both books today and Make Your Game Legendary!